The leading health problems in United States today are largely lifestyle related. More than 61 percent of all deaths in United States are caused by cardiovascular disease and cancer. Almost 80 percent of these deaths could be prevented through a healthy lifestyle program. The third and fourth leading causes of death are chronic and obstructive pulmonary disease (COPD) and accidents. The most prevalent degenerative diseases in the United States are those of the cardiovascular system. 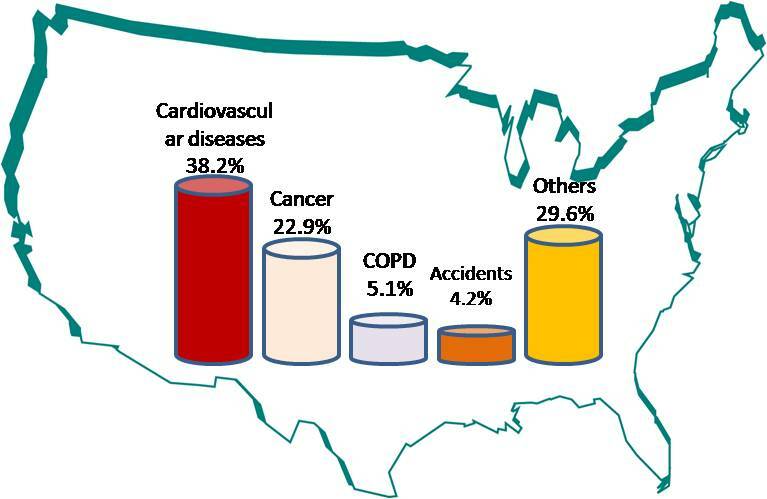 38% of all deaths in US are attributed to diseases of the heart and blood vessels. According to the American Heart Association, over 61.8 million people in the US are afflicted with diseases of the cardiovascular system. About 1.1 million people have heart attacks each year and almost 500,000 of them die as a result. The second leading cause of death in United States is cancer. Unlike cardiovascular disease, the mortality rate for cancer has increased steadily over the last few decades. Although cancer is not the number one killer, it is the number-one health fear of the American people. About 23 percent of all deaths in the US are attributable to cancer. The major contributor to the increase in the incidence of cancer during the last five decades is lung cancer. 87% of lung cancer is caused by tobacco use. Furthermore, smoking accounts for more than 30 percent of all cancer deaths. The American Cancer Society maintains that the most influential factor in fighting cancer today is prevention through health education programs. Evidence indicates that as much as 80 percent of all human cancer can be prevented through positive lifestyle behaviors. The third cause of death, chronic and obstructive pulmonary disease (COPD), is related mostly to tobacco use. Accidents are the fourth leading cause of death. Even though not all accidents are preventable, many are. Fatal accidents are often related to abusing drugs and not wearing seat belts. Most people do not perceive accidents as a health problem. Even so, accidents affect the total well-being of millions of Americans each year. Accidents prevention and personal safety are part of a health enhancement program aimed at achieving a better quality of life. Proper nutrition, exercise, stress management, and abstinence from cigarette smoking are a little help if the person is involved in a disabling or fatal accident as a result of distraction, a single reckless decision, or not wearing seat belts properly.